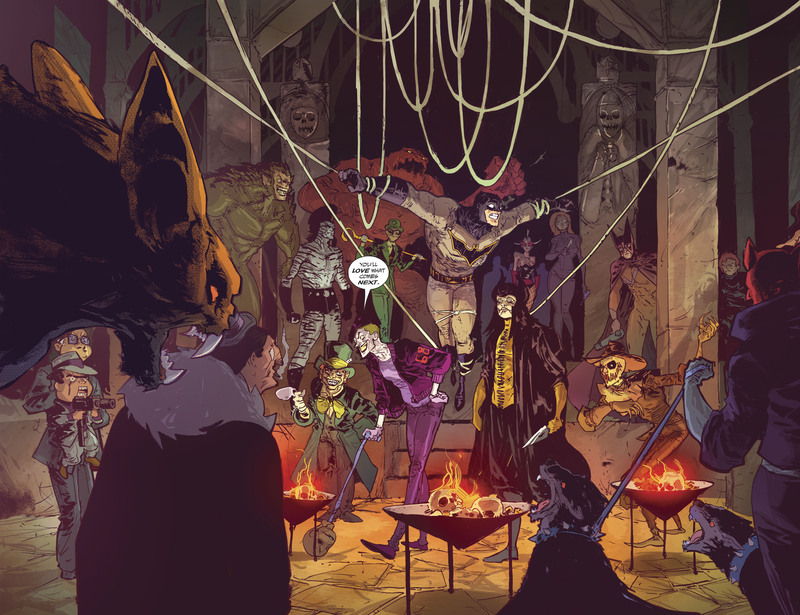 scans_daily | Last month's Batman/the Shadow #3 had the former captured. 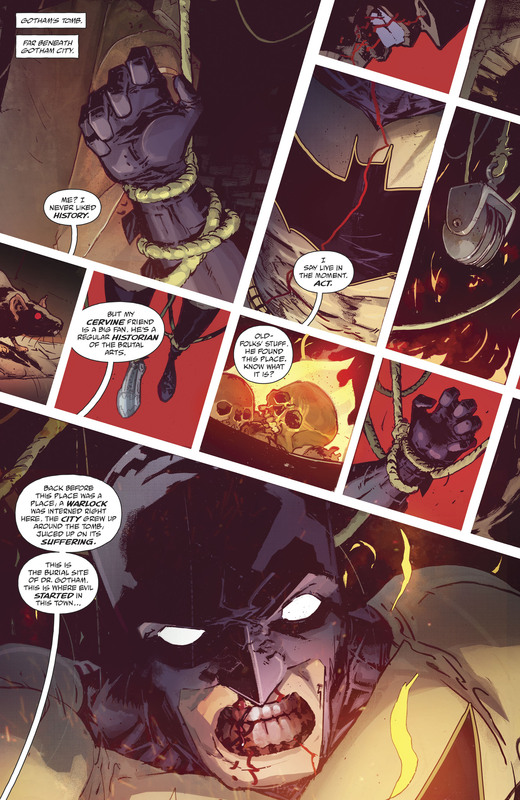 Last month's Batman/the Shadow #3 had the former captured. The Joker and the Stag (the ritual murderer of exemplars introduced in last year's Batman Annual) knocked him out.
" Exciting! " smiled the Joker.
" I wasn't sure you'd wake up this time. " This week's #4 continued where that left off.
" And where it finally catches up with you, Batman. " Then he realized that he'd stopped laughing.
" That's not me. " The Shadow dropped in from above, shooting off Batman's ropes. The two of them went to work. I've been binge-reading the old Shadow pulps, one a day, for half a year, and within the last month or two I've read the one where the Shadow subdues a tiger in its cage, and another where he stops two charging attack dogs with a word. Evidently he didn't just learn stealth tricks in Asia. Everything that was cool about the current Batman was done by The Shadow first. Although really, as described by Gibson, he didn't look like this, or like he does on the pulp covers. Only Theodore Tinsley, Walter Gibson's pinch-hinter, had anyone see the Shadow's nose, so alike to Lamont Cranston's or Kent Allard's hawk nose and profile. Gibson told us again and again that "only his burning eyes were visible" between the slouch hat and the upturned collar of his cloak, which covered most of his face. He also wore black gloves. The Shadow looked a lot like a Black Rider in Tolkien--only with two .45s in each hand. Man, it is awesome to run into someone who has the same love of The Shadow as me. I've gotten up to '45 or so in the stories and I admit I've stalled. I need to find more time to read them again because I want to finish them all. Yeah. There has been some speculation that after the early years of the Shadow, he eventually found someone who could restore his face by surgery, so he didn't have to assume makeup just to look like--himself. Sometime before THE SHADOW UNMASKS...maybe someone recommended by Dr. Rupert Sayre, his medical ally. I recognize almost every villain here, except the two on the far right of the upper level in the two-pager, and the fuzzy guy between Zebra-Man and Man-Bat. 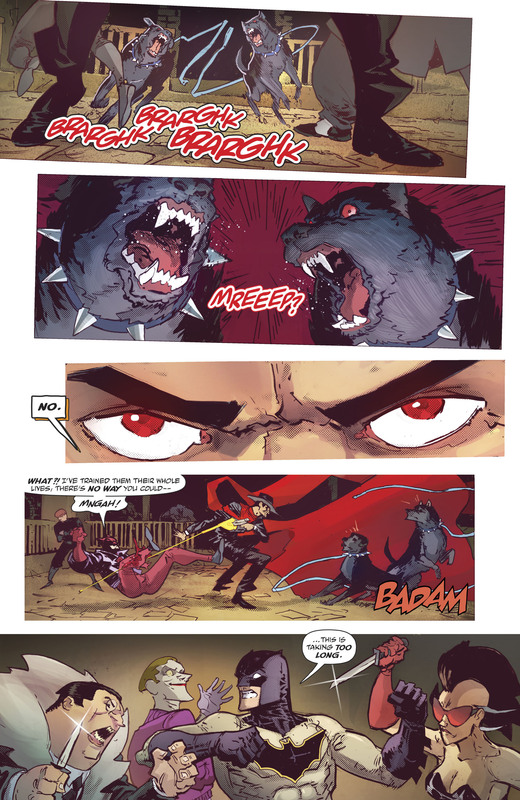 And I'm happy to see Hellhound, just because I have loved his costume from the first issue I saw with him. Fuzzy guy might be Floronic Man. He doesn't really have a consistent character model, but he's sometimes drawn like that. Huh. I've never seen Woodrew drawn near that beefy. Seeing as they're throwing in Magpie and the Wrath, they're going for some very obscure villains, not sure I recognise them (and I'm usually quite good at spotting obscure Batvillains... though at least one of them is very, very generic looking. Wrath! That's who the guy on the far right is...or...at least the one I thought was on the far right when I first looked...I didn't notice that it went on past the edge of my screen. ... Not that I know who the guy at the ACTUAL far right is...unless he's Per Degaton, which doesn't make sense since he's not Gotham based, at least as far as I've seen. But he sure looks like him. But that's at least one more positively identified...leaving Maybe-Woodrue (but probably not), Maybe-Degaton (also probably not) and the lady in purple (who I'm assuming is the 'very, very generic' one you mention). The lady in purple is with the dagger is vaguely familiar, which is irritating. Given the colour of the outfit and the dagger and gun I think she's holding, she might be a somewhat off model Talia perhaps? Not just being part of the group, but putting herself into the fight in a way that she'd go down as soon as it got going. 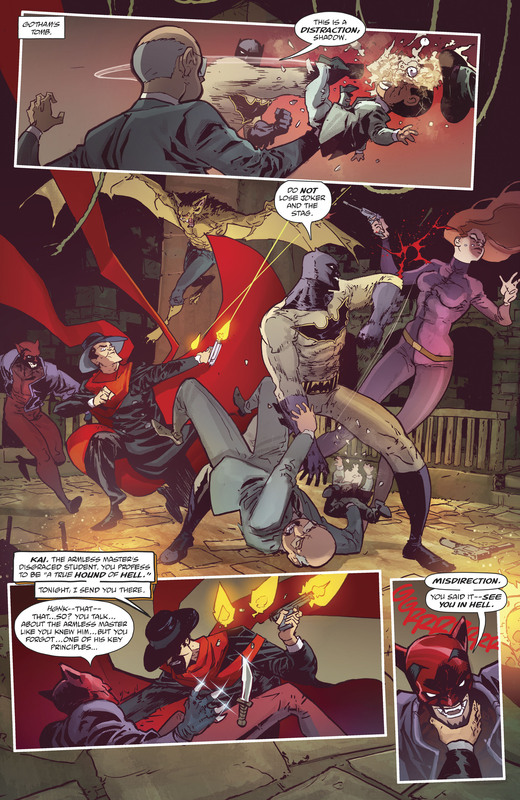 Batman and Shadow being the heroes, she was going to lose, obviously, but one punch in the middle of a melee is, like, 'banged the booker's partner'-level jobbing.